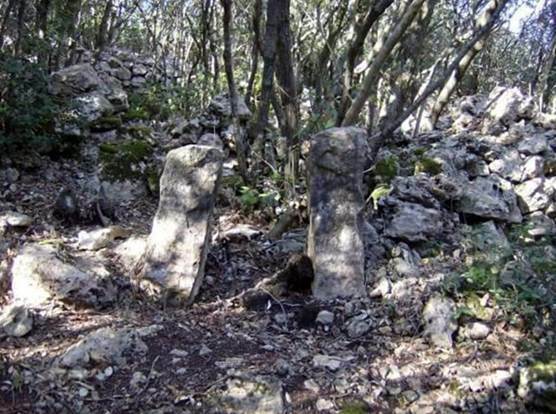 This paper reports the latest findings on the stone observatory of Bric Pinarella (Finale Ligure, Savona, northern Italy), first described in 2006 at the conference of the Italian Society of Archaeoastronomy (SIA). The settlement is located near the upland plain of the Mànie, which is an area known for the archaeological remains and the natural attractions. The settlement is constituted of three archaeological evidences: a small building, two short standing stones 44 centimeters apart, and a standing stone vertically fitted in the ground with a natural hole in its free end. Archeoastronomical investigations demonstrated that the hole in the standing stone allows positioning of the sunrise at the equinoxes over the Mànie skyline, whereas the two standing stones allow tracing of the local meridian with azimuth 360°↔180°. Other possible astronomical functions such as the identification of the elongation of the Sun from the east cardinal point and the study of the Sun and Moon’s upper meridian transit (in this respect the site could be described as a rudimentary meridian circle) are discussed in the paper. Despite the fact that, to date, its construction time is still unknown, the most recent findings show that the whole site could be an old astronomical observatory. The stone observatory at Bric Pinarella is a rural settlement located in the Finale Ligure’s hinterland, on the Ligurian Apennines (northern Italy; φ 44°11'58"N; λ 8°19'56"E, alt. 359 m.a.s.l.). The site was first brought to the attention of the local scientific community in the 1960s by the Research Group of the Istituto Internazionale di Studi Liguri, Section of Finale Ligure (Mr. Giuseppe Vicino, curator of the Civic Archaeological Museum of Finale, personal communication with one of the authors of this study). 3. A standing stone with a natural hole in its top end vertically fitted in a natural fissure of the ground, about 30 meters away from the building and the other two standing stones. 5. The Castellaro di S. Bernardino: a prehistoric settlement on the top of the St. Bernardino hill that can be dated to the Bronze Age (Del Lucchese, 1987, pp. 133–135 and personal communication of the same author with one of the authors of this study). 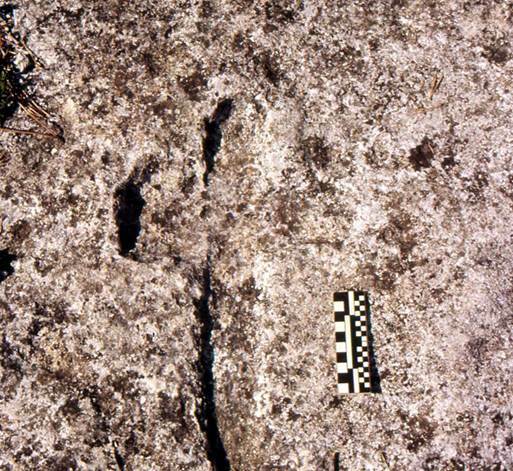 Large concentrations of petroglyphs are located in areas such as Ciappo de Cunche, Ciappo dei Ceci (also known as Le Conchette; Priuli, Pucci, 1994, pp. 35–43) and at Mount Cucco (Codebò, 1996, pp. 138–141). Unfortunately, none of these petroglyphs can be dated accurately since there are no comparison of known age in the area for such type of rock art (Issel, 1908, pp. 467–484; Giuggiola, 1973, pp. 111–167; Tizzoni, 1976, pp. 84–102; Leale Anfossi, 1976, p. 18–27; Studi Genuensi, 1982, pp. 1–84; Odetti, Ravaccia 1988, pp. 13–15. ; Fella, Zennaro, 1991, pp. 247–248; Priuli, Pucci, 1994, pp. 35–55; Codebo’, 1996, pp. 138–141; Codebo’, 1999). At the north and south ends of the mountain ridge are located two Romanesque churches: St. Lorenzino and St. Cipriano. The latter was in connection with the medieval settlement of Lacremà, currently abandoned. After detailed studies, the church of St. Cipriano revealed an early Christian apse (Frondoni, 1990, pp. 423–426) that was probably an influential point of the Julia Augusta. This was an important Roman road built by the Emperor Augustus since the 13 B.C. to connect Rome with the southern Gaul. Important remains of this road are the five bridges in the Ponci’s Valley, in very good conditions still now (although they were re-built at the time of Emperor Adrian). 3. The Camporotondo’s cromlech (Codebò, 1997a, pp 735-751), currently under investigation by two of the authors of this paper. The cromlech shows three corners interrupting a circular profile. Two of the corners are oriented toward the cardinal points north and south, respectively. Figure 1. 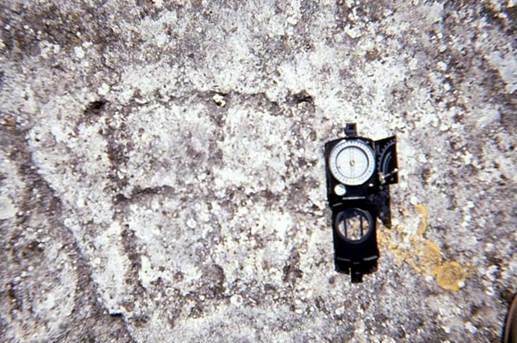 Cruciform petroglyphs at Ciappo de Cunche (copyright Mario Codebò). Figure 2. Cruciform petroglyphs at Ciappo dei Ceci (copyright Mario Codebò). Thickness of the north and east walls measured on their top is of about 0.85 m, whereas the south wall is about 1.10 m thick (thickness of the west wall at the time of the survey could not be measured precisely because of some debris covering its central part). Space available inside the building is about 8 m long and 4 m wide. No openings such as doors or windows are currently visible in these remains. 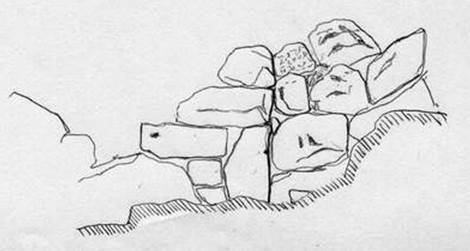 However three vertically aligned stones in the inner front of the south wall suggest existence of an interruption in the fabric of the wall (fig. 4) that could be related to an opening (such as a door) or a corner of an earlier layout of the building (which, in this case, could have had at least two building phases). Figure 4. 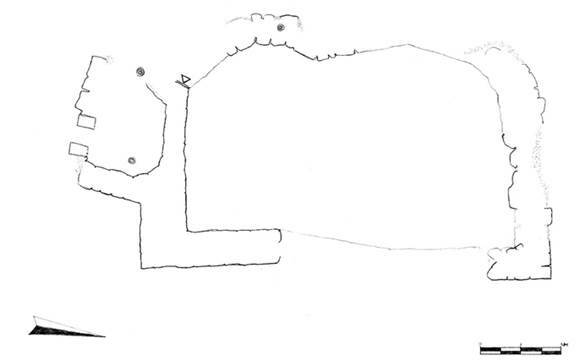 Sketch of the elevation representing the interruption in the fabric of the south wall that could be related to an opening (such as a door) or a corner of an earlier layout of the building. Walls are preserved for up to 2 m above the ground and are made of stones of various sizes, laid without mortar (fig. 5). Stones were sourced locally and used without specific preparation. Stone alignments within the walls are irregular and characterized by a high number of voids. Cornerstones are generally bigger than the other stones. Overall, the building technique can be described as inaccurate and attributed to non-specialized builders. Figure 5. East wall of the "casella" built without the use of mortar (copyright Mario Codebò). The south space outside the casella is occupied by two walls about 65 cm thick, built almost perpendicularly to the south wall of the main structure. All together, these walls surround an area of 1.85 x 2.42 m, which is adjacent to the main compartment of the building but inaccessible from it. The only access to this small space was probably located in the south side, currently partially destroyed. The only existing remains on this side of the construction are two short standing stones 0.44 metres apart that stand out from the rest of the walls (fig. 6). Figure 6. The two standing stone located near the southern wall of the building in figure 3. The stones are 44 cm apart (copyright Alfredo Pirondini). The space between these stones is too small for being crossed by an adult human being. Nevertheless, it cannot be ruled out that the small compartment outside the main building was functional to the activities taking place in the adjacent structure. 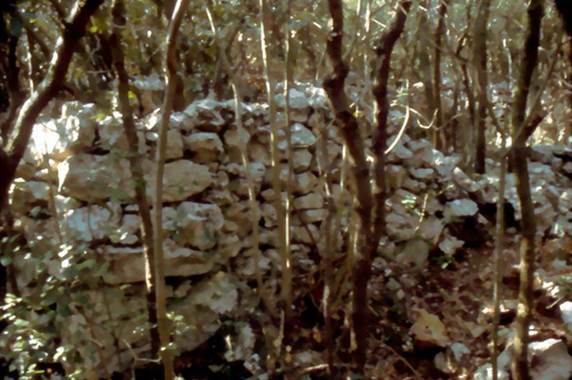 With the goal of dating the building, the area inside the main compartment close to the east wall (where archaeologists supposed that some archaeological evidence could have been found), was archaeologically investigated by Angiolo Del Lucchese (archaeologist and director of the Soprintendenza Archeologia della Liguria) together with the archaeological practice "G. Viarengo". Unfortunately, the excavation did not produce evidence of anthropic origin so that, to date, no chronological information is yet available on the use or on the construction time of this structure. Difficulties in investigating the archaeological context in the whole area of Finale Ligure are very common. This is due to the karstic nature of the soil and to the erosive action of the rain that, except for the grottos, easily washes away and mixes the soil and, with it, the archaeological and geological record. An example of this effect (called debitage by French archaeologists) is the record found during the archaeological excavation of the site of St. Antonino of Perti carried out by Prof Giovanni Murialdo and dated to the Late Antiquity. In this site, archaeological evidences from the Mousterian Age (Middle Palaeolithic) were found mixed with materials from the Bronze Age and with materials from Byzantine Age, in a single stratum of few centimetres thickness. About 30 m southeast from the casella is located a large rocky outcrop characterized by a fracture some centimetres wide and several centimetres deep, cutting through the hole outcrop. This is at the edge of a steep slope facing east toward the upland plain of the Mànie. The fracture hosts an isolated standing stone with a hole in its top end (fig. 7). According to the former curator of the Civic Archaeological Museum of Finale, Mr Giuseppe Vicino, who surveyed the site several times, the fissure, the standing stone and the related hole are of natural origin and acquired their characteristics because of the chemical and geological composition of the stone, called Pietra del Finale. Geologist Dr Davide Gori, who inspected some photographs of the outcrop, confirmed the natural origin of the fissure. Figure 7. Standing stone vertically fitted in a natural fissure of the rock with a natural hole in its top end. 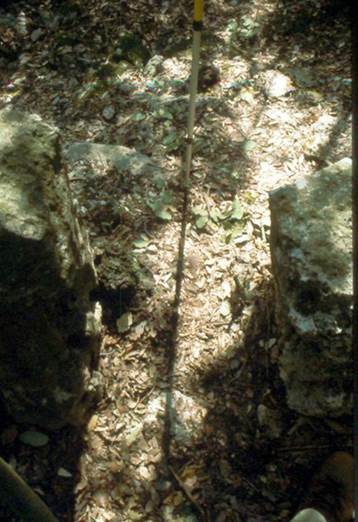 This stone is about 30 meters away from the building in figure 3 (copyright Mario Codebò). However, despite the natural origin of the three elements, arrangement of the standing stone in the fissure and placement of the hole at its free end cannot be considered natural. This is confirmed by the presence of a stone fragment at the bottom of the standing stone, used to fix it in the fracture. Presence of this fragment suggests that insertion of the standing stone in the rock is, actually, of anthropic origin. First person to point out an astronomical alignment of the standing stone overlooking the upland plane of the Mànie was Mr Pino Piccardo, an associate of the Civic Archaeological Museum of Finale Ligure (Mr Giuseppe Vicino, personal communication with one of the authors of this paper). Mr Piccardo found that the hole in the standing stone, frames the point where the Sun rises during the equinoxes. To confirm this observation and verify further astronomical functions for the whole site, Mario Codebò carried out a full archaeoastronomical survey from 21st to 23rd March 2003. Measurements taken with a prismatic compass Wilkie of the horizontal arch visible through the hole when the compass sight is placed against the hole (e.g. fig. 8) is 74° – 93°. Figure 8. 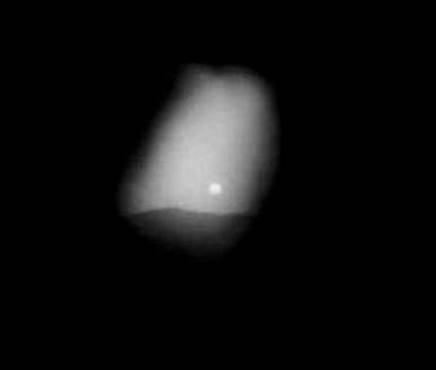 The sunrise on 23rd March 2003, photographed with the camera’s lens against the hole (copyright Mario Codebò). This implies that the sunrise can be seen from approximately mid-March to mid-April and from mid-September to mid-October. However, observation of the same horizontal arch from short distance (i.e. with the compass sight not against the hole) allows seeing the sunrise only at the equinoxes. In such conditions, the Sun looks like a point of light as represented in figure 9. Figure 9. The point of light created by the sun when observed through the hole from some distance from the stone and at the equinoxes’ sunrises (copyright Sara Pelazza). 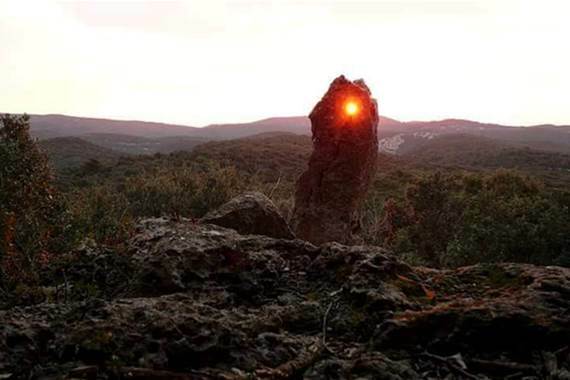 The hole in the standing stone allows identification of the sunrise at the equinoxes on the skyline of the Mànie upland. 1. The sunrise during the rest of the year (i.e. between two solstices) is clearly visible on the Manie’s horizon from the location of the standing stone (although outside the hole). The hole in the standing stone allows identification of the elongation of the Sun from the east cardinal point. a. The Sun’s upper meridian transit and, therefore, the moment of the true noon (fig. 10). Figure 10. Shadow of the gnomon when it is positioned in between the two standing stones represented in figure 7. At the time in which this image was taken, the time of the local (or true, or astronomical) noon was 12:33:22 on 23rd March 2003 (local const. : 12:26:40; equation of true time on 23rd March 2003: +06:42; copyright M. Codebò). b. The different altitudes of the Sun during its meridian transit, through the four seasons. By correlating the various altitudes of the Sun with the elongations of the two points of sunrise between the two solstices, it would have been possible to identify the width of the diurnal arc of the Sun. This arch is minimum during the winter solstice (when the Sun’s meridian altitude is at its minimum and the rising point is the southern) and is maximum during the summer solstice (when the Sun’s meridian altitude is at its maximum and the rising point is the northern). At the equinoxes, when the Sun rises within the hole of the standing stone, the related meridian altitude is intermediate. Theoretically, it would have been possible to measure also the obliquity of the ecliptic, if precise tools for Zenith measurement were available. c. The Moon’s upper meridian transit. d. The daily delay of about 50 minutes of the Moon transit over the local meridian, compared to any star. e. The difference between the sidereal month (27.32 days) and the synodic month (29.5 days). This study demonstrates the uniqueness of the remains at Bric Pinarella. This observatory is located in an area (called Finalese) that has been populated since the Lower Palaeolithic and therefore has accumulated a rich archaeological record. The few but distinctive remains still visible on site do not allow dating the settlement but provide unequivocal evidence of the interest and of the tools used in the past to study the movement of celestial bodies. In fact, although the age of the archaeological evidences at Bric Pinarella is still unknown, it is possible to suppose that the site was used as a rudimentary astronomical observatory: a kind of elementary Greenwich astronomical observatory along the northern coast of the Mediterranean Sea. We hope that these findings will foster new archaeological investigations in particular aimed to date this ancient site that possesses characteristics to some extent unique (at least in Italy) since it allowed the simultaneous measurement of the most important astronomical times: the daily ephemerides. Authors are grateful to everyone who contributed to this research and, in particular to: Davide Gori; Angiolo Del Lucchese; Tiziano Mannoni; Pino Piccardo; Giorgio Viarengo; Giuseppe Vicino. Thanks are also due to Mr. Lorenzo Carlini, Ms. Sara Pelazza and Mr. Alfredo Pirondini for having granted the right to publish their photos. According to the requirements of the Italian Universities, we declare that, although this paper is the product of a collaborative work, "Introduction" and the section "Natural environment and archaeological framework" were written by H. De Santis; section "Archaeological evidences" was written together by H. De Santis and G.L. Pesce; section "Astronomical functions" was written by M. Codebò. · Codebò, 1996 – Codebò, M. Segnalazioni inedite sul Monte Cucco nel Finalese. In: Bollettino del Centro Camuno di Studi Preistorici, 29, Edizioni del Centro, Brescia, Italy, 1996, pp. 138–141, http://www.archaeoastronomy.it/segnalazioni_inedite_monte_cucco.htm. · Codebò, 1997a – Codebò, M. Prime indagini archeoastronomiche in Liguria. Memorie S.A.It., 1997, 68(3), Italy, pp. 735-751, http://www.archaeoastronomy.it/prime_indagini_archeoastronomiche.htm. · Codebò, 1997b – Codebò, M. Problemi generali dell'indagine archeoastronomica. In Atti del I Seminario A.L.S.S.A., 1997, Genova, Italy, http://www.archaeoastronomy.it/corso_elementare_archeoastronomia.htm. · Codebò, 1999. – Codebò, M. Archaeoastronomical hypotheses on some Ligurian engravings. In: I.F.R.A.O. Proceedings of the World Congress of Rock Art News95, Centro Studi e Museo d'Arte Preistorica Ce.S.M.A.P., Pinerolo (TO), Italy, 1999, CD–Rom, http://www.archaeoastronomy.it/archaeoastronomical_ipoteses.htm. · Codebò, 2010 – Codebò, M. L'algoritmo giuliano del Sole. In Atti del XII Seminario A.L.S.S.A., Genova, Italy,, http://www.archaeoastronomy.it/algoritmo_sole.htm . · Codebò, 2013 – Codebò, M. Il metodo nautico. In Atti del XV Seminario A.L.S.S.A., Genova, Italy, http://www.archaeoastronomy.it/Metodo_nautico.htm . · Codebò, 2015 – Codebò, M. Dall'altezza misurata all'altezza vera. In Atti del XVI Seminario A.L.S.S.A., Genova, Italy, http://www.archaeoastronomy.it/altezza_misurata_vera.htm . · Codebò, De Santis, Pesce, 2011 – Codebò, M.; De Santis, H.; Pesce, G.L. L'osservatorio in pietra di Bric Pianarella (SV). In Astronomia culturale in Italia, edited by Società Italiana di Archeoastronomia, Milano, Italy, 2011, pp. 177–185, http://www.archaeoastronomy.it/BricPianarella.htm . · Del Lucchese, 1987 – Del Lucchese, A. Bric Reseghe. In Archeologia in Liguria III.1: Scavi e Scoperte 1982–1986, Tormena, Genova, Italy, 1987, pp. 133–135. · Fella, Zennaro, 1991 – Fella, M.; Zennaro, D. Petroglifi inediti al Riparo dei Buoi. In Atti del Convegno su M. Bégo, Tende, France, 1991, pp. 247–248. · Frondoni, 1990 – Frondoni, A.; S. Cipriano, Campagna di scavo 1986. In Archeologia in Liguria III.2: Scavi e Scoperte 1982–1986, Tormena, Genova, Italy, 1990, pp. 423–426. · Giuggiola, 1973 – Giuggiola, O. Le incisioni schematiche dell'Arma della Moretta. In: Rivista di Studi Liguri, XXXIX, Bordighera, Italy, 1973, pp. 111–167. · Issel, 1908 – Issel, A. Liguria preistorica. In Atti della Società Ligure di Storia Patria, XL, Genova, Italy, 1908, pp. 467–484. · Leale Anfossi, 1976 – Leale Anfossi, M.; Il Ciappo del Sale. In Mondo Archeologico, 9, Firenze, Italy, 1976, pp. 18–27. · Maggi, Pastorino, 1984 – Maggi, R.; Pastorino, M.V. Riparo Fascette I. 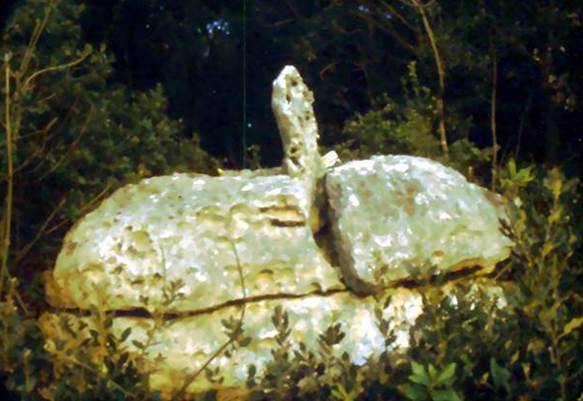 In Archeologia in Liguria II: Scavi e Scoperte 1976–1981, Tormena, Genova, Italy, 1984, pp. 171–175. · Odetti, 1987a – Odetti G.; Grotta I del Vacché. In Archeologia in Liguria III.1: Scavi e Scoperte 1982–1986, Tormena, Genova, Italy, 1987, pp. 129–131. · Odetti, 1987b – Odetti, G.; Riparo del Bric Reseghe. In Archeologia in Liguria III.1: Scavi e Scoperte 1982–1986, Tormena, Genova, Italy, 1987, p. 132. · Odetti, Ravaccia, 1988 – Odetti, G.; Ravaccia, C.; Aggiornamento sulle incisioni del Finale. In: Atti del II Convegno sulle Incisioni Rupestri in Liguria, Millesimo (SV), Italy, 1988, pp. 13–15. · Priuli, Pucci, 1994 – Priuli, A.; Pucci, I. Incisioni rupestri e megalitismo in Liguria. Priuli & Verlucca, Ivrea (TO), Italy, 1994. · Studi Genuensi, 1982 – Atti del convegno sulle incisioni rupestri in Liguria. In: Studi Genuensi, NS, Genova, Italy, 1982, pp. 1–84. · Tizzoni, 1976 – Tizzoni, M. Incisioni all'aperto nel Finalese. In: BCSP, 13–14, Capo di Ponte (BS), Italy, 1976, pp. 84–102. © This article is an open access article distributed under the terms and conditions of the Creative Commons by Attribution (CC-BY) license (http://creativecommons.org/licenses/by/4.0/).